How was everyone’s weekend? Do anything crazy? After a relaxing weekend, I was more than ready to get after it at CrossFit this morning. Usually Mondays at CrossFit are the hardest WODs of the week, but this one was, thankfully, not terrible. It was the perfect WOD to ease into the week with. We started with 25 jumping jacks and 25 mountain climbers then did three sets of the squat, push up, and ring row circuit. My whole body was tight and really needed the warm up. There were a few warm-up sets where we had to work up to our 5 rep weight. Our goal was to get heavy enough where we were pushing ourselves for all reps, but not too heavy where we couldn’t complete all three sets at five reps a piece. If we could only do four reps on the third set, then that set didn’t count. We would have to shed the weight to get the five reps in, then count the lower weight towards our overall total. I was partnered with someone who lifts a little bit more than I do (alright, a lot more) on the regular. I followed her lead for the first warm-up sets, but I think I may have jumped too high with her. We went from 75 lbs (where I felt really comfortable) to 95 lbs (where I could only do two reps at a time) and I quickly realized I had gone too heavy. I reverted back to 85 lbs and felt comfortable enough with that weight for all three sets of reps.
There’s something to be said to why a good warm-up is important. Instead of feeling weaker on my last set of reps, I felt stronger, as if I could have done more at that weight or gone higher. I bet if I hadn’t jumped so quickly in the initial warm-up, I could have built up to 95 for the reps. Learned my lesson there – I should test my own limits at my own pace and not be tempted when my bar partner jumps weight a lot quicker than I should. Also, a good warm-up is key to a successful WOD. I love sprints. You push yourself really hard for a short amount of time, then you get to rest. Who doesn’t love resting? We did a total of 10 sprints in the span of 5 minutes. Blackberries were on sale at Fresh Market yesterday. I don’t usually shop at Fresh Market but the huge sign that read blackberries were on sale for 98 cents per 6 oz container caught my attention. I bought two! The blackberries were on my mind this morning, I knew I wanted to have them with some yogurt and cereal. How fun are these runner-themed Christmas trees Runner’s World has been posting on their Facebook page?! Love blackberries! Not often that they are on sale – that’s a great buy! Those trees are so fun!! Love the star made of bibs! I have a few medals on our tree! I always toss the bibs though :/ I think blackberries are delish year round, yum! HAH. Those trees are awesome! I saw those trees on Runner’s World on Friday…absolutely love it! I’ve only got a couple of medals right now, but someday when I have more, I’ll be all over this. Haha, I don’t have enough medals to do that. My brothers could though! Haha! A sibling running medal tree then!? The trees are cute, but I would feel uncomfortable displaying medals in such an in-your-face way. It strikes me as kind of braggy. Never even thought about incorporating races onto the tree but what a unique idea! We totally put our race medals on the tree this year. Even between the two of us we don’t have nearly as many as the one in your photo, and we put them on with all the other ornaments, but it’s still fun! I saw one of those race medal trees on RW Daily the other week… and I totally copied it and hung some of our race medals from our tree this year! None have fallen off yet either! I’m glad you had a great weekend Meghann! Good for you pushing you what sounds like a really tough WOD–Sprints are killer. We did Fran today–hardest 7 minutes I’ve had in a long while. I got such a kick out of those Christmas trees when I first saw them. That right there is motivation to run more races! I have some races incorporated on to my tree… Kind of. 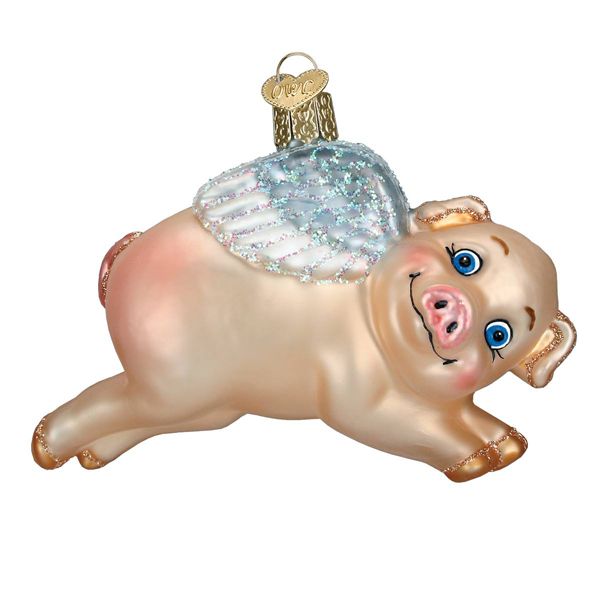 I have an ornament that is a flying pig that my mom bought me after the marathon. Does that count? Emily N recently posted..A Rest Day (lame) and my TREE! I’d say that counts! i think it would be fun to start collecting ornaments from all the races Derek and I run. I think we need a Ragnar one!